Hey Grant! Where does the new pic for Longhorn and Shorthorn come from? Was Penelope also built by Jim? From this page, linked to from this thread. No idea about Penelope. It seems likely, but then again, I've never seen any mention of her anywhere else. Hm, I'm not sure that's the best image to use. It appears to be tribute art done in 2004 probably based on someone's memories of the characters. We don't use fan art on the wiki, but I think we can link to that page from the Longhorn and Shorthorn article. Oh dang, I didn't even notice the copyright date. I assumed it was an old piece of advertising for the show. Are we sure that it's tribute art? That could just be the date it was scanned and uploaded. It's not vintage. The artist's name is there (and one can see the difference between it and actual old ads on the same page; compare with this, which may have been used by the artist as an inspiration). Note that there's no date on any of the actual vintage photos or print ads. "Muppet Theater" wouldn't have been used at the time (earliest use of "Muppet" we can find is 1955, and it seems dubious it would have been on a setpiece). The text all present is new (in a space left open for it on the "theater" thing), and its combined with the portrait of Joe Campbell used at the top of the page. The text also says "after the likenesses" (which is basically another way to say an artist's rendition; to what extent it was based on surviving images of the actual puppets if any, or character designs, or just an estimate based on what's known, we really can't be sure). Case closed. Too bad; it would be great to see what they looked like. Thanks, Andrew. Yeah, the Campbell people are really weird about their "ownership" of the creation of those characters. Hi Grant! Do you remember your source for Rollie Krewson as Marvin Suggs' designer? 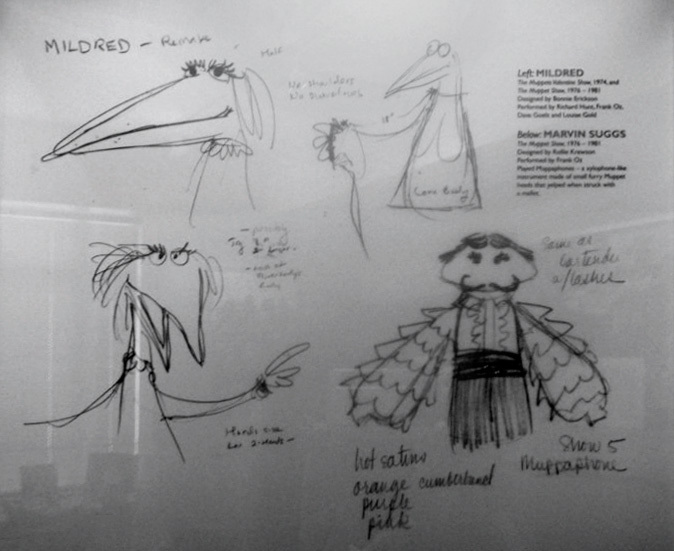 A placard for him at Center for Puppetry Arts, Worlds of Puppetry, Jim Henson Collection lists Jim Henson as the designer and Mari Kaestle as the builder. It's possible they made a mistake, but I thought I'd drop a line here to clarify. Thanks! Terrific, thanks! I missed that tiny text; good eye. Both sources are signs at exhibits, so who knows which one is right. I'll reach out and see what I can find. Hi Grant! Apologies for going back in time 9 years, but I've got a question about Recycled puppets. The original version of the article created by you in May 2006 lists Elmo and Baby Monster. In June 2007 you expanded the explanation with the following: "the furry red puppet used for a minor Sesame Street character named Baby Monster was recycled a decade later to become the show's ultra-popular Elmo." We recently discussed this at Thread:179028 which resulted in the Rumor/Disambiguation page Baby Monster. Do you happen to remember what your sources were? We've got Wisdom of Big Bird, a Street Gang audio interview, and a Good Morning America so far. I know Caroll's been telling this story a lot, so I'm interested in citing them all if we can. Thanks! Hey Scott! My sources were those same two -- Wisdom of Big Bird and Spinney's interview on the Street Gang disc. Looks like you've got a pretty thorough discussion going! Great, thanks Grant! I hope someday we find out what Caroll is talking about. I guess we'll find out if we ever see any segments with a monster family where the baby is clearly performed by Caroll Spinney. In the past few months, several rare episodes from seasons 1, 10, 12, and more recently 20 and 22 have mysteriously surfaced online. If this keeps up, I hope that several season 2 and 3 episodes are next. Is there a way that I can actually WATCH the UK versions of "The Honk of Honks" and "Change of Address"? Maybe somewhere... I don't have them either. I got those screenshots from a thread on Muppet Central. Hey, Grant! You're pretty good at spotting things like this, so I thought I'd toss it out to you. James Bobin has done the Vertigo Effect in both of his Muppet movies now. Once in M11 when Walter hears Richman's plan, and again in MMW when Piggy sees Kermit and Constantine together in the church. I feel like I've seen the Muppets do this elsewhere, but I can't think of where. Any thoughts? Hey Scott! Thanks for thinking of me, but I'm afraid I can't think of any other examples. I'll let you know if I do, though! Thanks Grant! I was thinking this would make a great article for the wiki, but I'm not sure it makes sense for just two instances. Hi, Grant! Just got back online last night. There *is* video of the Murgatroyd character, but I don't own the disc it was on. I know it wasn't YouTube but one of the DVD releases (I think *not* the ones with the obnoxious CG superimposed additions, I avoided that for Wiki research purposes). If I can figure out which specific disc or set, I'll let you know. I don't know if this was the only appearance of the character or not (I was mostly keeping an eye out for Spinney's on-camera roles like Grandma Nellie, and found out the kangaroo also showed part of his face, but in the meantime found myself of course noting other suit or puppet roles in passing, and this caught my attention, a step above what they usually had on the show; the fact they only had four supporting cast members at any one time plus Bozo and a very small space made it an inherently cheaper and smaller looking circus compared to the generally better regarded Chicago version, which wasn't what Larry Harmon chose to have syndicated though). Thanks! It's pretty cool that Caroll did something so close to what Jim was doing. I did something similar myself a few years ago. And yeah, sometimes there are influences or one artist borrows from another, but (outside of say old comedy routines, where it usually was outright stealing, but everyone did it so pinpointing an originator is rare) in many cases it's just synchronicity (although I plan to write something soon about some showbiz influences on specific Muppet characters which aren't really as obvious, and already documented some on [[Lefty the Salesman], but as in most of the best cases, he's a composite, borrowing a few traits and catchphrases from two characters but the even breathier delivery and "Riiiight" were original, so the result stands up as characterization, compared to a pure ripoff). I think coincidental synchronicity is clearly the case here (similar enough that it's striking and startling, but also clearly different in purpose and some specifics; Murgatroyd is more slapsticky or plain novelty, eating a pie and so on).